. .. An urgent call out to anyone who is able to get into Gloucester this Wednesday (Jan 13). At 10am, county councillors are being given a “non-public” briefing on fracking and unconventional hydrocarbons (ie coalbed methane). We believe the briefing should be public. We need to hear what councillors are being told by their officers (or whoever is involved in the briefing). And we’re going to demonstrate (however many of us can get there for 9.15-9.30am) outside Shire Hall. At 1.30pm on Wednesday there will be a meeting of the Environment & Communities Scrutiny, where they will be dealing with a motion on the table from Cllr Kirby. This Council believes that climate change is real and that it is a serious problem that affects our communities. We note fracking (hydraulic fracturing for shale gas) adds to climate change. 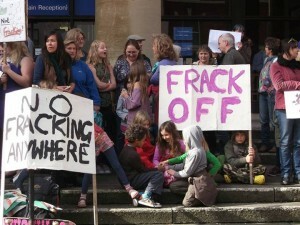 This Council further notes the recent protests against shale gas drilling outside Shire Hall. This Council notes there are areas now available in Gloucestershire particularly the Forest of Dean for fracking. This Council also recognises the instability of the geology in the Forest of Dean. Furthermore this Council acknowledges that the process poses a significant risk to the local environment due to the unknown and commercially hidden information about the extraction process. This Council resolves to write to the Secretary of State to remove the licensing areas within Gloucestershire with immediate effect.